For our trip to Joshua Tree we used airbnb for the first time and stayed in a fantastic house. The view at sunrise was just one of the perks. The scenery in the park is stunning: giant piles of climbable rock are everywhere and the Mojave desert landscape is thickly dotted with Joshua Trees. I hired a climbing guide, Steve, who is a Joshua Tree and Yosemite legend, to get me onto some of Joshua Tree's 7,000 documented climbs. Being a weekday in the middle of winter the park was really quiet, and we had our pick of climbs, but it happened that a group was working its way up Dappled Mare, which was one we wanted. Instead we did The Swift beside it, which was a great climb. The weather was amazing: warm with no wind. We also did Toe Jam as a jamming and smearing warm up, then Mike's Books, where we spotted a couple of coyotes cruising through the parking lot. 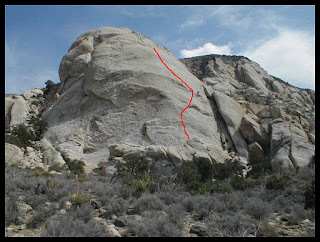 To finish the day we did Walk on The Wild Side - an uber classic smear fest up the front of a giant piece of granite called saddle rock. It was a new style of climbing for me: relying solely on your soles for multiple pitches where your only hand 'holds' are tiny little quartz crystals. There was a significant distance between bolts: I was glad Steve was leading. We added a pitch to reach the top and had a couple of big abseils off the back. Great climb.